Welcome to BGSUHockey.com! Falcon hockey has a special place in the hearts of fans and alumni from Bowling Green State University. Falcon hockey has produced 15 All-Americans, 10 Olympians, 2 Hobey Baker award winners, and the 1984 National Championship. With a history as rich as this it’s not difficult to see why hundreds of thousands of fans who have entered the BGSU Ice Arena have experienced love at first sight. 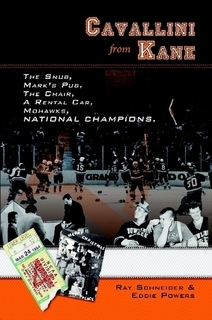 BGSUHockey.com was the culmination of various alumni who felt that such a special program should receive more coverage than it did. With arguably the largest BGSU alumni following these individuals have come together to bring a new site that would be worthy of such a storied program. BGSUHockey.com is an independent, alumni-run news site about the Falcon hockey program. We are not affiliated with BGSU in any way other than being credentialed members of the media. The official website of the BGSU athletic department is BGSUFalcons.com. A simple answer to why we’re here is that all of us love Falcon hockey! We felt that a great BGSU hockey site was something that was missing. This site is for you: the fans and alumni who are still connected to this team and want the best news, features, photos, and more. Please add us to your daily visits and we promise we’ll do our best to make this site something that Falcon fans can be proud of. Todd is a BGSU alum twice-over, graduating with his undergraduate degree in Visual Communications Technology (2006) and then his Masters degree in Career and Technology Education (2008). He grew up in a suburb of Cincinnati, Ohio, and has been an avid hockey fan since the early 90’s, when he used to watch Mario Lemieux and the Penguins any chance he could get. He was the assistant sports editor, then sports editor and finally the managing graphic editor for his high school newspaper, where he honed his love of photography. Todd has been an active photographer since 1998, when he learned to develop his own black and white film. When he came to BGSU in 2002, he transitioned into the digital world by scanning his film negatives for his VCT classes. Todd started photographing BGSU athletics back in 2009 when he contacted Grant Cummings, then owner of BGSU fansite Ay-Ziggy-Zoomba.com. Todd became the official AZZ photographer and has been hooked up with BGSU Athletic photography ever since. Focusing on the major BGSU sports (football, basketball, and hockey), Todd spent the next few years building an extensive library of BGSU sports photos. Currently, Todd is the Manager of the Distance Education group at Wright State University and is also an Instructional Designer with WSU. He lives in Dayton, Ohio, and tries to make it a priority to be at any Falcon hockey game that he can attend, including many of the away games. Outside of Falcon hockey and photographing BGSU athletic events, Todd enjoys cars and hanging out with friends. Todd can be reached on Twitter @BGHockeyPhotos or by email at Todd@bgsuhockey.com. Drew has been a fan of hockey since the first ever game of the Columbus Blue Jackets in 2000. His excitement for the game grew even more when he attended BGSU beginning in 2003. His favorite player while at BGSU was Kevin Bieksa who is now a star defensemen for the Vancouver Canucks. Drew has spent a significant amount of time in the program including a stint assisting the coaching staff in 2006-2007 as a volunteer where he tracked a multitude of statistics in-game. This season is his seventh covering the team in a media role. He has been the editor for the now defunct BringBacktheGlory.org, hockey contributor for Ay-Ziggy-Zoomba.com and was the creator of the Falcon Hockey Weekly podcast. Currently, he works at a northwest Ohio hospital and lives in Bowling Green. In Drew’s free time he enjoys golfing, home brewing, and watching other non-ice sports (specifically baseball and football). Drew can be reached on Twitter @BGSUHockeySite or by email at Drew@bgsuhockey.com.